Among all the rebellious issue no-one has a greater importance than the First war of independence also sometimes called as Revolt of 1857, in which people of all caste and creed came together, got united and fought against the British. During the 19th Century, the English East India Company had brought a major portion of Indians under its control. Indian Rulers like Rani Laxmibai of Jhansi and several others had lost their kingdom under ‘Doctrine of Lapse’. The Sepoys mutiny was also one of the reasons for the revolt of 1857, the sepoys were supplied with new cartridges wrapped with paper greased with the fat of cow and pig, and it has to chew off with the mouth. This led to the angered and hurt the sentiments of both Hindu and Muslims soldiers of the army. The First War of Independence was a series of the rebellious issue which took place in different places in Central and North India. The First War of Independence began on 10th May 1857, in the town of Meerut. 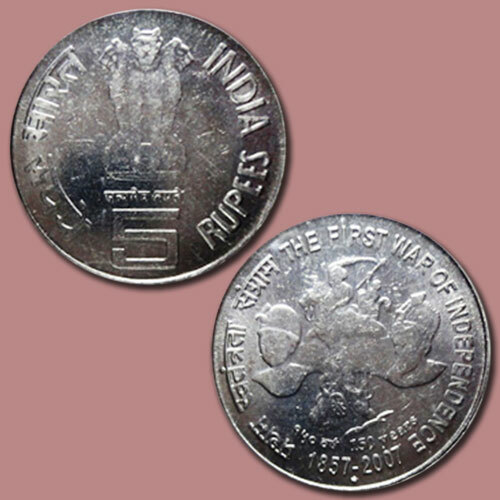 The Indian government had issued a 5 Rupee Commemorative coin on 18th April 2008. The obverse of the coin is inscribed with the portrait of ‘General Tatia Tope’, ‘Emperor Bahadur Shah II’, ‘Rani Laxmibai’ of Jhansi, with the inscription ‘Pratham Swatantrata Sangram’ in Devnagari’ and ‘THE FIRST WAR OF INDEPENDENCE’ in Roman to the left and right periphery. The Inscription ‘150 Varsha’ in Devnagari and ‘150 Years’ in Roman is written at the bottom above the date ‘1857-2007’. The reverse is inscribed with ‘Ashoka Lion’ with ‘Satyameva Jayate’ and the Value 5 in the centre, and ‘Indian Rupee’ written in Roman to the right and ‘Bharat Rupaye’ in Devanagari to the left. Catch out more details about similar coin on our website.